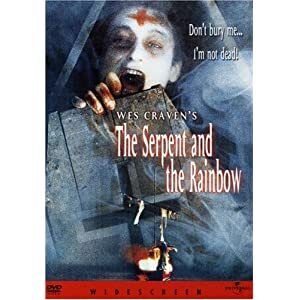 Long before 'Scream', Wes Craven made a frightening masterpiece called The Serpent and the Rainbow. It's a fact based horror film that explores voodoo and black magic in a serious, non-condescending way. And it's frighteningly realistic. If you've ever been afraid of being buried alive, this film will terrify you. A Harvard researcher goes to Haiti to search for an ingredient used in voodoo to simulate death. Things get more dangerous as he gets closer to finding what he is looking for, until his quest for knowledge turns into a horrific nightmare!